It is Day 4 of the 31 Days of Inspired Nail Art Challenge! That means, it's time for some green nails!!! Exciting, right? Well, not really...green isn't my "it' color. I'm a blue person, and many of my polishes are blue based. So, you can guess that I'm rather excited for Day 5 :). Originally, I was going to do some super cute frogs. I was beyond excited. Painted on a base of sky blue (yes I know it wasn't blue day, but the froggies would have made up for the green) and I had the little heads drawn on. Then I added the details, and well, they didn't look like frogs. Ribbit, ribbit, disasticure. 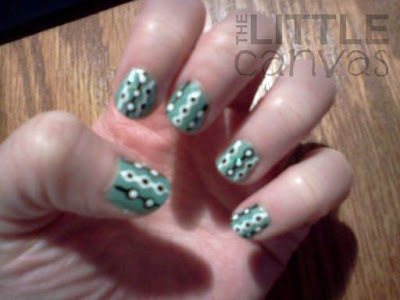 So, I grabbed my bottle of my favorite green polish and recreated a retro dot design I did before I started blogging. One I forgot about until one of my followers on Twitter (@DubiGil) tweeted me a picture of her retro dot design. All I have to show for my original design is a horrible blurry cell phone picture, which I have added at the bottom of this post! Love, love, love, LOVE this manicure! It's so simple, easy, and eye catching. I also loveeeee the base color, Mint Apple. It is by far one of my favorite Sinful Color polishes, and well actually probably my favorite polish among my whole stash. It is a gorgeous darker mint shimmer that has full coverage with two coats. For this manicure, I used three coats because I really wanted the color to pop. 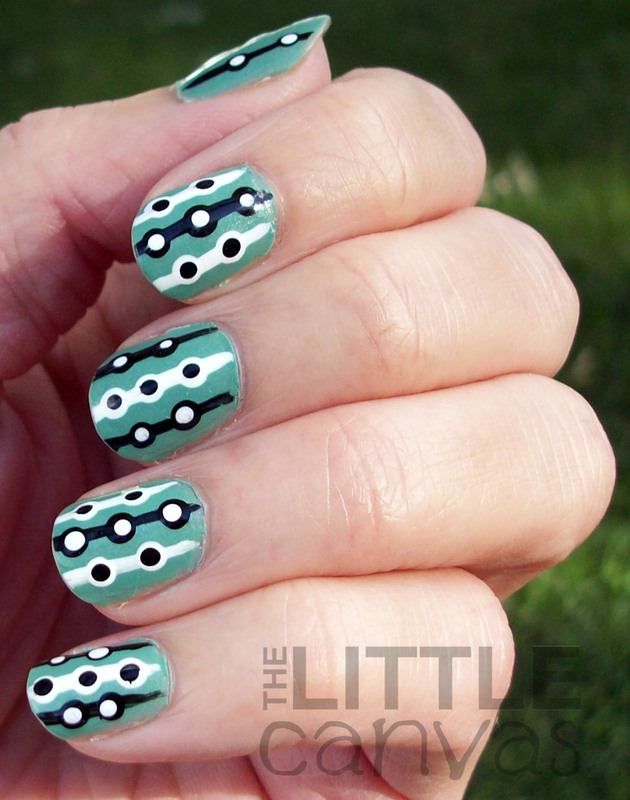 To get the design, I striped on my lines, then with the dotting tool added the dots. It really is a simple manicure that does not take much time at all! Here is my awful picture of my original attempt....I know, I know blurry! I can't believe I posted this to my personal facebook way back when! Ahhh look at my lil nubs! I thought my nails were currently nubbed, but these are so much shorter! I'm happy I'm finally growing them out a tad! Have to say, looking at that old picture, I did pretty dang well considering I wasn't blogging yet and was never using base or top coats! hahaha. Oh, how I have come a long way! What do you think? Something you would try to do? What's your favorite color polish that you would use as a base if you were to do this manicure? Thank you @DubiGil for reminding me of this awesome design!!! This is why I love when you guys tweet me your designs! I love seeing them!!!!! As a reminder, this is the 31 Days of Inspired Nail Art Challenge! 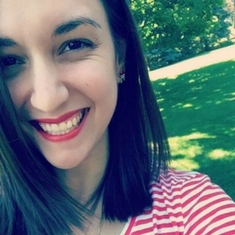 Do not forget to check out the other lovely ladies posts! Said it before and I'll say it again - love this! Such a retro feel, but the mint tone make it more modern. So cute! love that mint polish. thank you! I'm going to have to try them again real soon...and by real soon, a few months lmao. If you try it i wanna see first!!!! <3 thank you! i think i could try this design.. i just got my nail art brushes and dotting tool, so i'm adding it to my incoming manicures. So pretty! Love e color scheme and design!